Why are Children Cheering Cruelty? Pretending animal abuse does not exist at the circus does not make it any less real; shielding children from the truth is unfair to them and to the animals. Parents and grandparents who want to raise compassionate, kind kids should stay away from the circus. Why would any parent or grandparent encourage their little ones to cheer and applaud animals being beaten and hurt? Most parents shield their children from cruelty and violence, yet some still take their kids to the Ringling Bros. circus to “enjoy” elephants being hit with bullhooks (a heavy baton with a sharp steel hook on the end) and tigers being violently whipped until they cringe and cower. Anaheim residents who don’t support cruelty to animals will be pleased to learn that our municipal code prohibits the exhibition of sick or injured animals, requires veterinary care to keep an animal healthy and requires that every precaution be taken to make sure that animals do not suffer. Our regulations make it clear that the city must deny a permit to any circus that is likely to violate the law. Of course that means Ringling Bros. circus. So why is this outfit in town again? It was only two summers ago that an elephant named Sarah collapsed while Ringling was in Anaheim. [See Sarah, Ringling Elephant, Collapses] And since that time, Ringling has paid a record penalty of more than a quarter million dollars to settle multiple violations of federal animal protection laws. Employees at arenas where the circus performs have reported elephants being abused with bullhooks and tigers never getting to step foot outside their transport cages except when they are performing. People everywhere were outraged to see photos of baby elephants at Ringling’s breeding compound tied down by all four legs, threatened with bullhooks and shocked with electric prods. Elephant mothers are devoted and protective, but chained and helpless, they cannot stop their babies from being ripped away forever. The babies shriek and cry out for their mothers, struggle to break free and resist as long as they can. Finally, their spirits broken, the exhausted youngsters give in. From that day on, all they’ll know is heartache and hurt. Is it any wonder that 30 of these keenly intelligent, emotionally complex animals have died in Ringling’s hands since 1992? Time and again Ringling handlers have been caught on tape hooking and hitting elephants for no reason other than it being standard operating procedure. People are often shocked to learn that the law does not prohibit bullhooks, whips or electric prods. 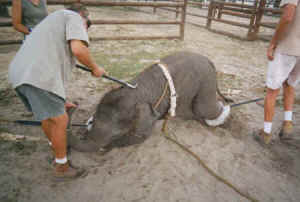 Former circus employees have recounted animals being whipped and beaten on a daily basis and being forced to perform even if they were sick or injured. It’s not only the exotic animals who suffer in the circus. Horses have been controlled with a “lip twist”—which is exactly what it sounds like—and jabbed with pitchforks. If parents teach children that it’s acceptable to use animals for their amusement, how can we expect them to extend kindness to others? Sending the message that violence towards animals is acceptable hardens children and separates animals into “us” and “them.” It’s not a far jump for kids to think it’s OK to bully the little guy in class as long as it gets them a laugh.